You may have noticed there have been some changes to the look and design of my blog over the last few days. I have been working with Live-Books to redesign the blog to better integrate and match my website at www.jholko.com. The new design does mean a number of significant improvements, but it also means some changes had to be made and a few things may have subsequently gotten lost or broken along the way. One of the features that has been lost is the WordPress ‘Like’ button; which was previously found at the bottom of each post. The ‘Like’ button is particular to sites hosted by WordPress and as I have moved my blog hosting over to Live-Books this feature has been lost. If you had previously clicked the ‘Like’ button and ‘Liked’ a post I apologise for this being removed (it was unavoidable). The good news is that all of the comments should have been captured and migrated over to the new site. One of the key benefits (other than better matching and integrating with my primary website) of moving to the new design is larger pixel dimensions for images and the ability to now click on an image and have it open in a new window whilst the surrounding background dims. This feature provides a much better viewer experience when looking at photographs. I am still in the process of updating a lot of the images on the blog so you may find a few that are not quite positioned correctly, or are not as yet correctly sized. Please just bear with me over the next week or so whilst I update any strays. Likewise, I am still updating the ‘topic categories’ and ‘tags’ so not all posts as yet will show up if you are using these features for browsing the blog. With over three years worth of posts and hyperlinks on my blog it is quite possible that there may be some dead links amongst the many pages. I will endeavour to fix these as I work my way through the site. If you do stumble across a dead link please drop me an email so I can fix it. If you had previously subscribed to my blog by either an RSS feed or via email you should still continue to receive notifications whenever a new post is made. I am currently working with Live-Books on adding a new subscription option to the blog and hope to have this finished in a few days. 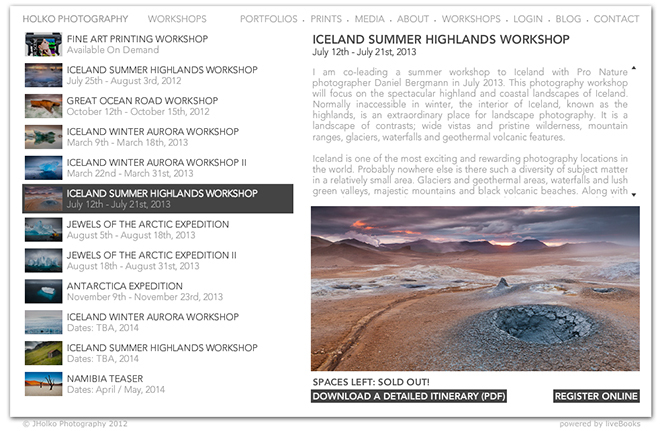 I have also redesigned the Workshops and Expeditions page at my website and this page is now up-to-date with trip information, including detailed PDF itineraries of each workshop. You can now also register to book onto a workshop or expedition directly online. I will continue to make workshop and expedition announcements and updates here on my blog as well as on my website so if you are just browsing past you can still get all the news. I will be making further refinements and changes to my website at www.jholko.com over the coming weeks. A reminder that you can also follow me on Facebook, Twitter and Google+ and please don’t forget to hit the ‘Like’ button as that helps me share my content with more people.